The Prednisone scared me. I’d heard so many horror stories about it. Friends that had taken it for even a short period of time like 2 weeks told me of 20 pound weight gains. I didn’t feel like the Prednisone made me eat any differently than I normally would except for the fact that I was on vacation. 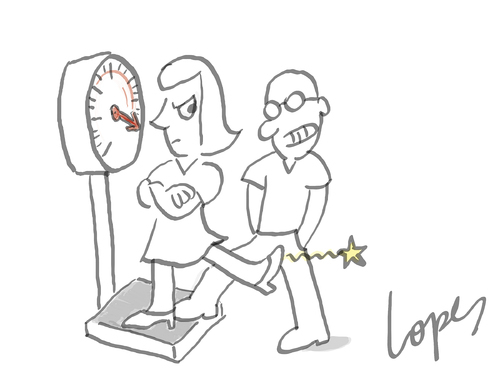 It’s hard to divorce the two factors when I stood in front of the scale this morning. I had to take responsibility for the part I played in whatever the scale said. Yes, I indulged on vacation. I own that. What? That can’t be right? I lost a pound? I stepped back on the scale again. A 2 pound difference in 5 seconds? What’s going on with my scale? I wiped it down (in case the microscopic dust was adding ounces LOL). I stepped back on the scale and the next two numbers were in the 144 range so I’m going with that. That was the consistent number. I realized that maybe the reason my size 4 jeans were suddenly really tight was all the salt I ate for two weeks. I was sucking down salty food in Arizona like there was no tomorrow. It’s not something I usually crave but I think it was the heat and sweating so much that I wanted salty food. It took about half a week to get over that once I got back to Oregon too. It makes sense that all that salt would cause bloating. About a 1 pound gain in March. I’m ecstatic about that! It could have been A LOT worse. The fact that I could go on vacation AND take steroids for a week and not really gain weight means I’m doing something right! Yippee! I own that 1 pound gain. I’m okay with it. Last night Michael and I made a very healthy dinner. 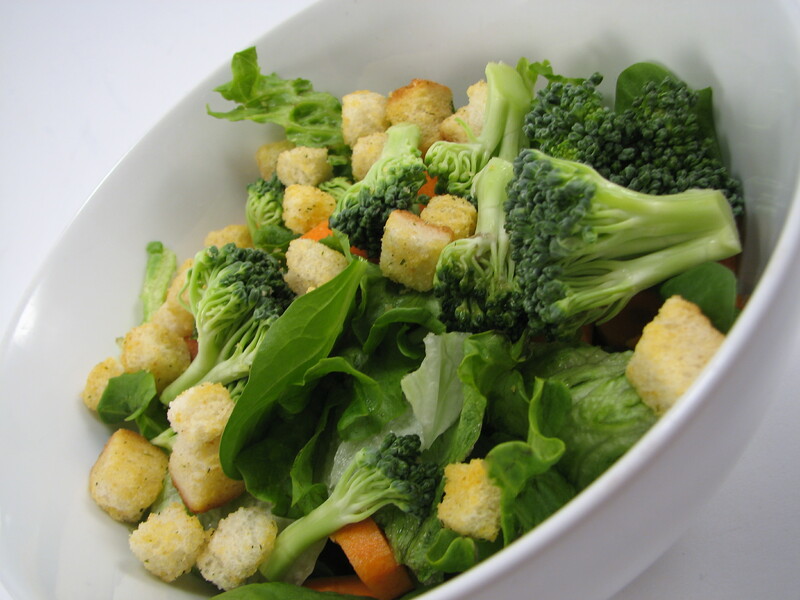 I made a salad for us to eat while we cooked. 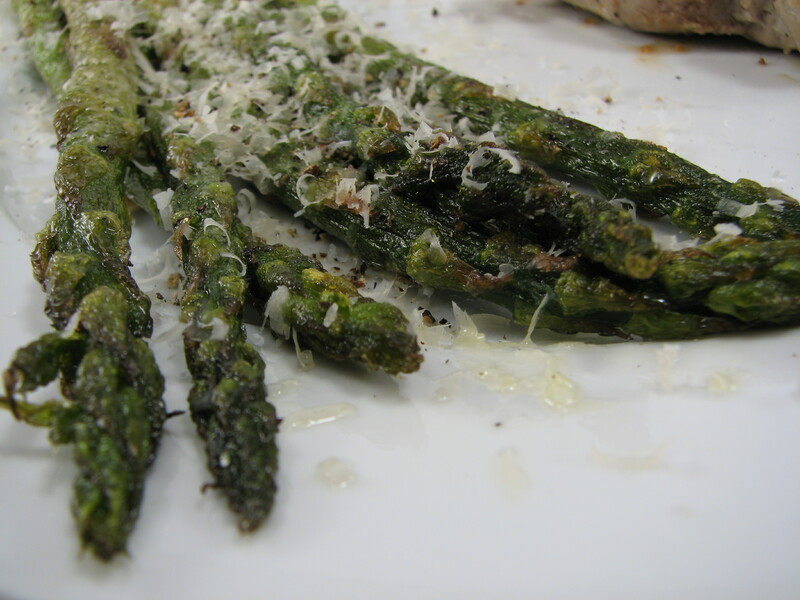 I washed and prepped the fresh asparagus and Michael cooked them in the skillet with Grape Seed Oil. If you’ve never tried cooking veggies in Grape Seed oil, give it a try. It’s much more flavorful than olive oil and the food just tastes so much better. 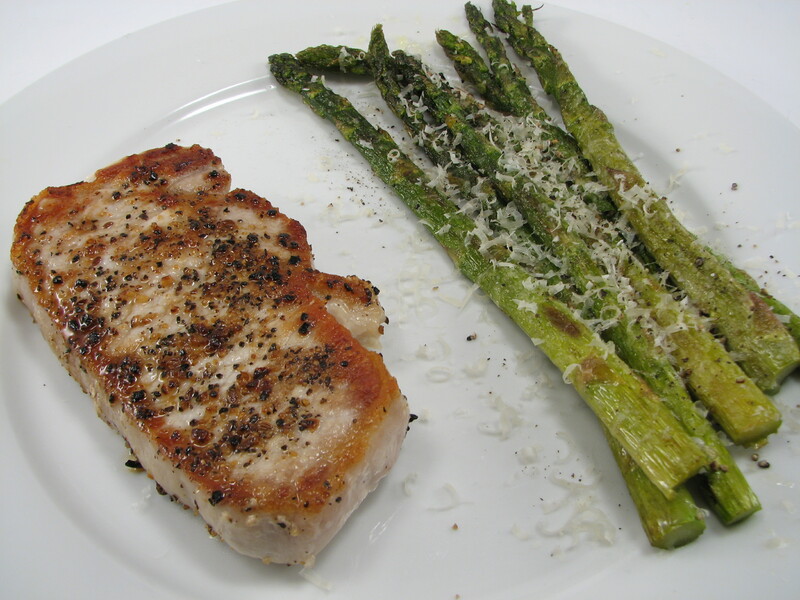 I shredded fresh Parmesan cheese on the asparagus and seasoned it with salt and pepper. Michael cooked the pork chops (boneless) in the skillet with steak seasoning and he nailed it this time. They were perfectly prepared. It was slightly more than 1 serving but I’m okay with that because it was a good protein and it filled me up. It was a great, simple dinner. 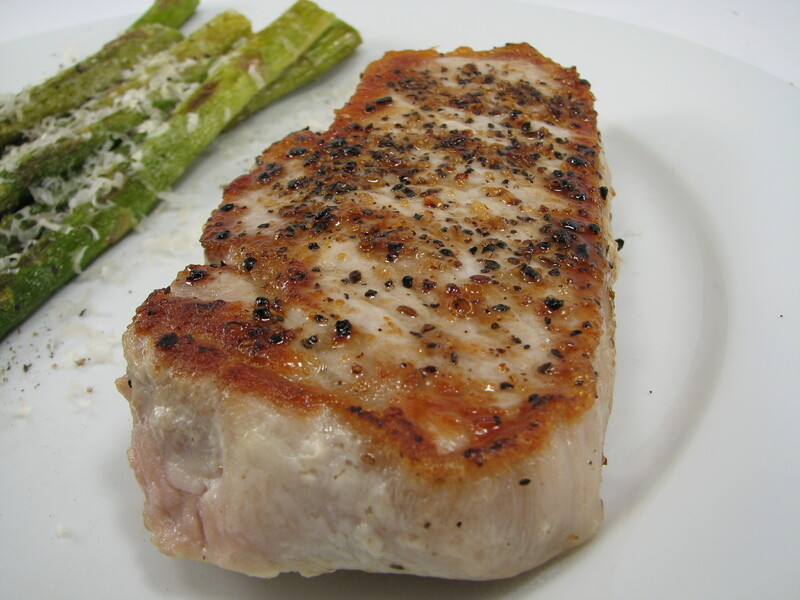 I’m glad the pork turned out well and it made me like pork chops again. Now that I’ve faced the scale and it wasn’t as bad as I thought I’m making the vow to myself to do better in April. I’ve been lax with my calorie counting and serving sizes. It’s time to be more diligent about that. QUESTION: Do you often gain weight on vacation? Seems like a healthy gain to me! Salt is my enemy too. Sometimes I crave it, and then when I eat it, I have to drink gallons of water! I feel like I’ve been “fueling” for my first half on Sunday and hope it won’t reflect too negatively when I step on the scale next week. But I’ll own the gain if it comes. Preparing for a half marathon for the first time gives me a little bit of freedom, I think! It’s naturally to gain a bit during training but don’t feel bad about it! Focus on your race! Good luck! I almost ALWAYS gain weight on vacation. My weight fluctuates a lot, like if I go out for happy hour or something I can be up 5-7 pounds the next day. Last night I ate ice cream and more thai food than usual, but didn’t go crazy or anything. My weight was up 3.2 lbs this morning! it’s crazy. My weight fluctuates A LOT too. That’s why I went to weighing in only once a month. I could have a 4-7 pound difference almost daily. I’m sure it has to do with salt, bloating, hormones, etc. But it was making me mental. When I took the prednisone, I didn’t have the weight gain, but it did wreak havoc with my immune system. After I finished it, I had to have an antibiotic, b/c I had bronchitis/pneumonia symptoms. I was wary of that side effect too. Especially since I was flying a lot to and from vacation. I thought that would be almost guarantee an illness! But I lucked out (so far, knock on wood). I always put on weight on vacation because we eat out so much more and I am super sensitive to restaurant food sodium, particularly since I eat so little processed foods at home. I usually drop 75% of the gain in a day or 2 after coming home and I figure what I weigh after that was the real net gain of weight. It comes off, though. And I tell you – eating out in New Orleans is totally worth gaining some weight over LOL! I agree with you! Sometimes eating out is worth the gain! I ate a lot of good food in Arizona, so I’m okay! I always forget about the high sodium in restaurant food. Thanks for reminding me. That’s great!!! You’re definitely doing things well. I usually gain weight while ON vacation because of extra salt and things…but I usually end up dropping a couple of pounds after being home for a week. It’s so weird. That seems to be the general consensus. I’m not alone in gaining on vacation!